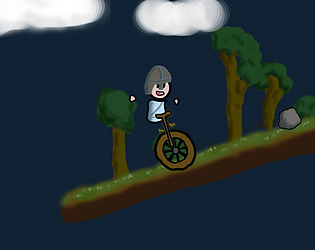 The player character takes to his unicycle to avenge his friend, and in doing so keeps the cycle of vengeance going. The best strategy appear to be to keep the wheel directly in front and use it as a lance. Even so, the rocks seem to break the physics of the rest of the game. I'm not sure how to jump high enough to reach the high ledge.